Since the launch of Rebirth in 2016, Patrick Gleason and Peter J. Tomasi have reinvigorated the Man of Steel through a series of powerful standalone stories in the pages of SUPERMAN. They’ve featured Lex Luthor, Eradicator, Apokolips and Mister Oz, among many others, but not Bizarro. Not until today’s SUPERMAN #42. “Bizarroverse” is a three-part story that features the return of Gleason to art as well as writing. It looks to expand the world of Bizarro in remarkable new directions…and it may surprise you. Especially if you’re one who sees Bizarro largely as a humorous villain. We recently spoke to Gleason about how this story came together, what it felt like to return to art and how he came to like the new character of Boyzarro so much, he made the story about him. So, it’s been almost two years since you and Peter started your run on Superman. Why do you think it took this long to get to Bizarro? It’s two years on a biweekly schedule, so in real schedule time, that’s like four years’ worth of work, basically. It’s a good question. He didn’t really stand out to us. But one day I was going through some old sketchbooks and I found one of my first Superman sketches, and I saw this Bizarro sketch that I had done. And I thought that he might be fun to draw. That’s really where it started. I met with Pete in Chicago last year and we started kicking around an idea of what the story could be, and it kind of took its shape slowly. 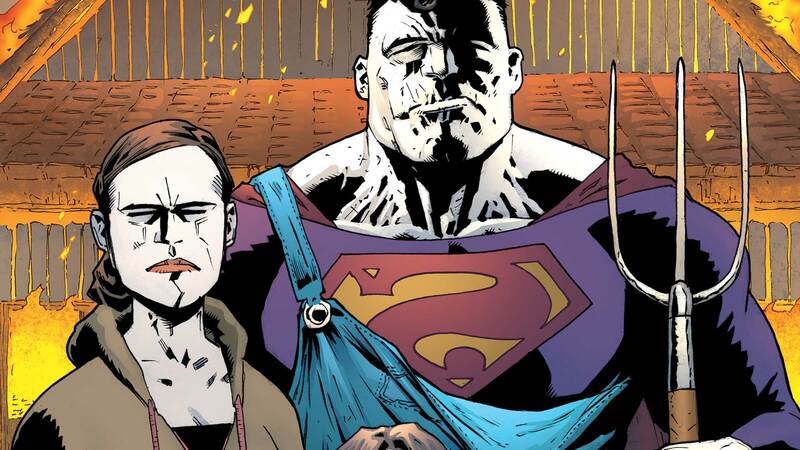 Basically, we wanted to do something with Bizarro, but focus on the character. He’s always been Superman’s opposite, but he’s never been this Superman’s opposite, with the family and things like that. That’s what was interesting to me, and Pete and I just had a blast talking about that and what that could look like. This comic has some long, extended interior narrative by Bizarro that I actually found a fun sort of challenge to get through. Was that difficult to write? So, when it came to this, I wanted to do the Bizarro version of that. I have to say, my brain is permanently changed by this. I finished dialoging the last issue, SUPERMAN #44, yesterday. When I got done, I was literally thinking in Bizarro-speak. Something is permanently wrong in my brain now! It was a challenge, but like you said, it’s fun challenge. It’s working different muscles, and you kind of play with double meanings and things like that. Again, the reason for that was because we want this Bizarro story to have a deeper meaning. It is fun, but there is really more behind it. At its core, this story is about fathers and sons, and the perception of Superman, Jon and Lois as that perfect family. That whole too-good-to-be-true kind of relationship. What Pete and I were interested in was if there was a version of that relationship that wasn’t perfect. One of the thoughts I had after reading this was that you have Superman and Jon who are Kryptonian, along with Bizarro and Boyzarro and Kathy and her grandfather, who also aren’t human. These are all very extreme, otherworldly characters, but the relationships are so recognizable and human. Was that one of your points, showing how universal these bonds are? Absolutely. No matter who you are or where you are, the people around you, whether they’re blood relatives or close relationships, they become your family. They become the relationships that shape who you are. That’s always been what we wanted to do with Superman, with Jon, specifically, and Hamilton and Kathy. We didn’t just want to give Jon a town to grow up in and then have him always running off to Metropolis. We wanted Hamilton to be his Smallville. Bringing her into this story was very intentional because we’ve always had plans to grow her beyond what she is. I’m always interested in creating new characters and playing with characters that are new because there isn’t a preconceived notion of where they’re going. I like there to be a variety and a freshness where you’re not sure who they are or how they’ll relate. I think it’s been great to see Kathy and Jon grow together and Superman and Boyzarro, too! Let’s talk about Boyzarro for a moment. After helping to introduce Jonathan Kent, was it fun to flip it on its head and introduce us to Boyzarro? Yes. Boyzarro was an idea that was kind of a joke. “Well, obviously if there’s a Bizarro, we need a Bizarro Boy, too.” That’s what I was calling him at the time. I did a sketch of him, and as soon as I drew it, I knew who that character was. I could see into this character’s soul. He was just a special character. So much so that I actually changed the end of issue #42. The original focus was going to be about Bizarro, but as I was writing the script, I called Pete up and told him that I thought this was actually a Boyzarro and Jon story. There was a fluid, organic process with this. It really took over. There’s a lot more, obviously, to come with him. So how did his name evolve from Bizarro Boy to Boyzarro? This first chapter blends humor with pathos pretty effectively, much of it due to the art. How do you pull that off? Obviously, writing with Pete is great because we can bounce these ideas off of each other, and a lot of the terrible ideas that I have never make it to the page because Pete will tell me it’s a terrible idea and not to do it! That’s always what I want to do in a story, whether I’m writing or drawing it. I want to get to the emotion and the character. You could have a great Michael Bay explosion, but if you don’t feel anything about the characters, then it doesn’t matter. If you’re not feeling anything, then all the hours that I put into the art ring hollow. At least for me. A benefit to writing and drawing is that I know exactly how they’re feeling, and I have total control of that, so I’m able to arrange things in a way to get the most emotion out of the reader. And it’s not me telling everyone how to feel. I think a lot of it is just getting out of the way. Giving you something to look at and read, and then let the reader fill in the blanks themselves. Less is more sometimes. The reader is bringing something to comics. They’re bringing their own experience, their own pasts and their own relatable feelings to this. With this issue, I really wanted to try and do something a little different with the art, which was not just draw with pencil, but with ink too. To ink myself. This not any slight to Mick Gray, who’s a fantastic inker that I’ve worked with for years, but it’s something that for this story, I wanted to have that control over. To approach it different and see if I could make it feel a little different. SUPERMAN #42 by Patrick Gleason, Peter J. Tomasi and Alejandro Sanchez is now available in print and as a digital download.